Each series of Flagstaff camping trailers is differentiated by a set of standard features, optional equipment, and other characteristics that makes it somewhat unique from the others. The classic series reflects Forest River’s traditional line of pop up camping trailers, which was expanded upon to create the other series in the line. Some of the features that you’ll find in the Classic series include a standard power lift system to help you set up, a swing-down galley to save space, and plenty of indoor seating and living space. 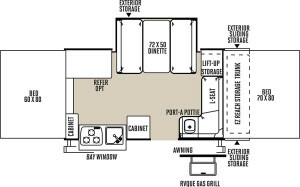 Flagstaff Classic Series 425D floor plan. Courtesy Forest River RV.